In Futamata area, there is a confluence of Shakain River and Tsuru River. At this spot, there are three bridges in Shakain River side, Futamata Bridge, Toshine Bridge and Shintoshine Bridge, and two bridges in Tsuru River side called Futamata Fukura Bridge and Shin Futamata Bridge. They are called Futamata Gokyo Five Bridges. Those bridges were built in different times and in different techniques, and this spot is a kind of field museum, where you can learn the transition of how they were built. 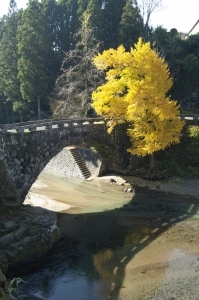 Among those five bridges, Futamata Bridge and Futamata Fukura Bridge were built in Edo Period. The two are rare twin bridges which were built at an angle of 90 degrees to each other. 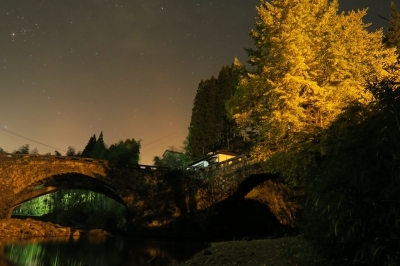 Futamata Bridge was built in 1829, and Futamata Fukura Bridge was built in 1830. 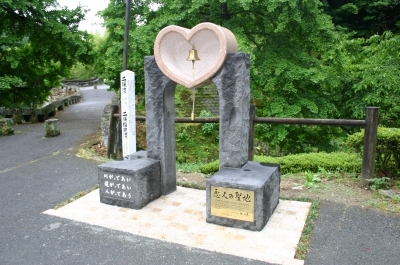 A head of Nakayama district, Koyama Kijuro, planned to build these bridges. He also planned to build a road from Matsubase area to Yabe area for the development of the district. The single-arched Futamata Bridge is 28 meters long, 3.3 meters wide and 8 meters high. Futamata Fukura Bridge, also a single-arched, is 27 meters long, 2.5 meters wide and 8 meters high. Both of them are designated as City's Cultural Properties. Also recently it was discovered that people can actually see a heart-shaped shadow on the river when you stand on Futamata Fukura Bridge and look down the Futamata Bridge from 11:30 am for 30 minutes from October to February. The sunshine and the silhouette of Futamata Bridge make a beautiful heart shape, and many people visit to see this illusory view.